Radishes are very simple and quick vegetables to grow and they are ideally suited to cultivation in raised beds and containers. They enjoy the light well draining soil and can be sown to fill in unused spaces. They also have the ability to grow very well in semi-shade. Indeed, in the height of summer they grow better if protected from full sun. There are three distinct types of radishes, the traditional summer radish, winter radishes and oriental / Chinese radishes. Below we recommend some varieties which we have grown successfully in raised beds and containers. A word of warning though about oriental and Chinese radishes - they take up a lot of room for the crop they produce. Their leaves spread and grow quite densely. 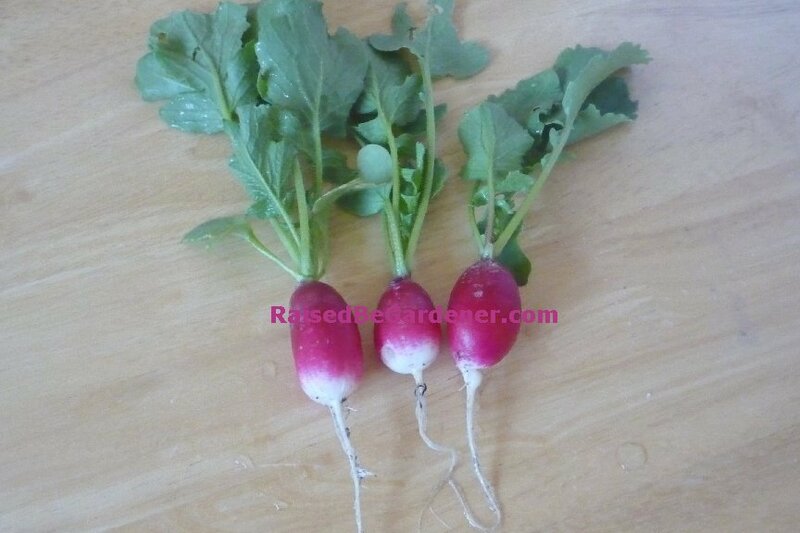 Summer radish are sown from March onwards and take four to eight weeks to mature. They do not keep well in the ground and should be eaten soon after harvest. Taste varies from mild to distinctly peppery. Scarlet Globe (AGM) has a crisp and crunchy texture, mild taste and a deep red colour. They are small roundish radishes with a pure white flesh. Sparkler (AGM) are red with white tips, a good sized radish with good texture and taste. Quick to mature. Jolly is our favourite at the moment! Good sized red radishes with crisp flesh and a great taste. Store far better in the ground compared to summer radish and take longer to mature. Sow seed in July / August and harvest from September to December. Black Spanish Long has black skin and white flesh. Excellent taste, can be eaten raw or cooked in casseroles and stews. These take around eight weeks plus to mature and have a different taste compared to traditional radish. They keep well in the ground and produce larger sized radish. Eat raw when young or in stir fry when mature. Mantanghong is round with a white outer skin but inside has bright purple flesh. A slightly sweet and nutty taste with a crunchy texture. The keep in the ground for a month or so without going woody. Mooli April Cross are white all the way through with a crisp texture and mild flavour. Another good keeper in the ground. Pink Dragon stands cold conditions exceptionally well. Excellent for stir frying. Summer radish can be sown from early March through to May. They can be sown through to September if they are protected from high temperatures. This can often be achieved by sowing seed near taller plants which will protect them from the full sun. Winter radish are sown in July and August. Oriental / Chinese radish are normally sown in late August to September although new varieties have good resistance to higher heat conditions. All types of radish are sown in the same way. Simply make a vey shallow drill in the raised bed soil and sprinkle the seed in. Because the seed is so small it is almost impossible not to have too many but the seed is very cheap. Cover with a sprinkling of soil and water in lightly. The seedlings will appear in one to two weeks. Summer radish kn raised beds and containers can be sown very densely, 5cm / 2in apart is a good distance between each plant and maybe 7cm / 3in between rows. 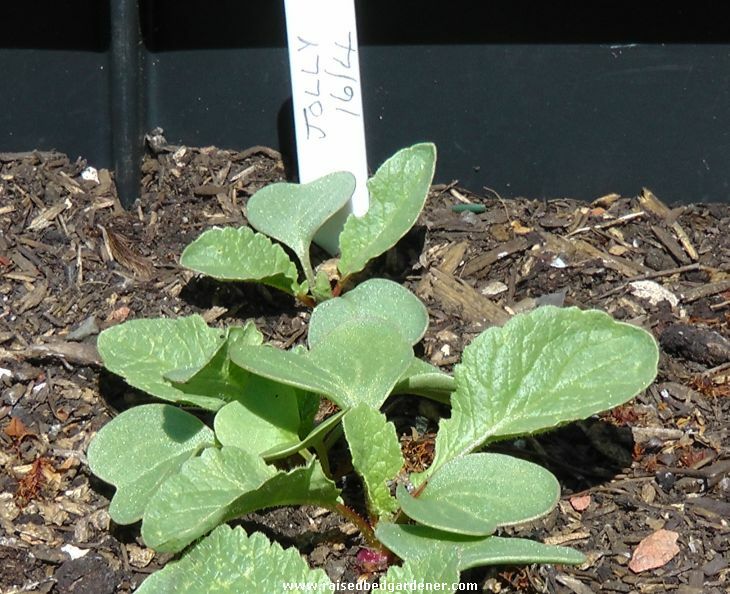 Oriental and Chinese radish however take up far more room - allow 30cm / 12in between each plants and each row. They grow very well in raised beds but we wouldn't recommend them because of the space required for each plant. The normal feeding, weeding and watering (see here) rules for a raised bed are all that is required for good radishes. Harvesting is simple, just pull the foliage near the soil and gently ease out the radish. 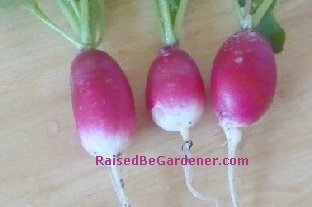 Summer radishes should be harvested when they are young typically about 2 to 3cm / 1in wide. If they are left in the soil longer they will turn woody and very peppery. Radish mature very quickly and the same ground can be used to grow several crops of radish. So when you harvest three or four radish it's a good idea to sow more seed in their place. In this way you will end up with a continuous harvest over several months. Winter and oriental / Chinese radish can be left in the ground for much longer so harvest when they are needed. If you want to eat oriental / Chinese radish raw then harvest them young.